Want to create a USB boot drive for Oracle Linux 7? First, make sure you have one with at least 16 GB. 1. On Microsoft Windows, download pwfree91-x86.iso. This will be used by the USB Installer program. 2. 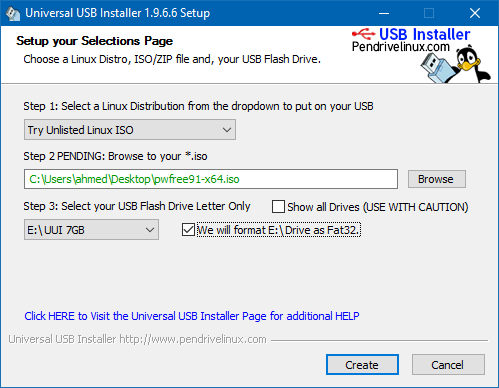 Download USB Installer 1.9.6.7. 3. Select the options below to format the USB drive and make it bootable. 4. Log in to an existing Oracle Linux installation (could be any VirtualBox image). 5. Make sure your USB drive is connected. 6. In my example below, I can see my USB drive mounted as /media/NEWVOLUME. 7. Unmount the USB drive. 8. Designate the first partition as bootable. 9. Download the Install_OL_fromUSBStick_Script script. 10. Download Oracle Linux 7 from the Oracle Software Delivery Cloud. 13. Make the script executable and run it. 14. Take the USB drive out of your machine, and put it back in so that it gets auto-mounted. 15. Copy the V100082-01.iso file to the USB drive which will be needed once installation begins.